In this case the man, isn’t actually a man at all. I am speaking about one of the many root causes facing depressed or underperforming downtowns much like Dallas while too many focus on the superficial issues. If we are to change the way our City looks and functions, we have to amend the urban “genotype” (underlying coding and dynamics) and the phenotype (physical form) will take care of itself. Last night, like one of many in a standing room only crowd at the Belmont Hotel, I listened to former Vancouver City Planning Director Larry Beasley talk about stuff, while everybody nodded in affirmation exactly as they were there to do. Beasley, did what just about any of us would do in a similar situation, and that is to capitalize on being in the right place at the right time and enter the private sector to export his experiences elsewhere. In Vancouver, a city that smartly rejected highways into its City to protect the intricate urban ecology of personal and economic interdependent connectivity, helped mold the regulatory environment when Japanese money by the gazillions found a safe haven during their lost decade in the form of real estate in a land locked City where there was literally nowhere to go but up, and the job was to establish the invisible volumes where investment filled in the form of a livable, urban structure. A beautiful city no doubt, but also not without its problems and advantages. We listened to him discuss HIS theories on cities which are really no different than anybody else’s, but like an experienced marketer, they are his. He talked about how he will do work in Abu Dhabi, but Dubai as if one is really different than the other (ya know, besides the fact that Abu Dhabi actually has oil, therefore still has real money to pay him unlike the flaunting, dancing, showboating, self-conscious sister city). Downtown Dallas has too many surface parking lots and vacancies. Glad he’s here. Sorry, for the so revered, I look for more nuggets of useful brilliance at $300 per hour or whatever his consultancy rate is. These kind of simple, superficial observations lead to the rabble asking, “why don’t we just fill’em all in? !” without asking the real questions, the tough questions of ourselves. To bring Dallas to the standard we pretend it to be, we hope it to be, this must be a deeply introspective process. The less we are willing to directly and honestly address them, the more expensive the revitalization process will be. The real issues at hand are written deep into the DNA of the City and it will take political action to undo and rewire the double-helix toward a sustainable, enjoyable, productive City of the 21st Century. The particular issue of downtown vacancy and underdevelopment must first acknowledge that the surface parking lots and parking garages littering the downtown core are the highest and best use of a downtown designed and built as a supersized office park with its suburban car delivery system. That highway system undermines demand. Demand which manifests itself as desirability, which in turn becomes investment which fills those invisible volumes in the way of vertical buildings and leasable space stacked to the limit demand will allow. Downtown Dallas isn’t New York City but we pretend it can yield similar heights of buildings, which in turn projects itself into land costs, which parking lot owners (currently generating revenue) won’t unload until they get a number that puts a sparkle in their eye. That difference of opinion regarding value of the land, then manifests itself as a gigantic gap between cost and profitability, which must be made up by city subsidization. Rather than making a potentially politically difficult move of “taking” away the perceived value of the land by declaring surface parking lots dangerous to public health or applying height limits on land to establish a more predictable value, we seem to be intent on the simple and expensive route where investment greatly exceeds the return for the City. Looking deeper, a recent article in Seattle rhetorically and self-indulgently asked, “which is the real problem suburbia or auto-dependence?” Being a self-aware, politically astute article, it didn’t want to demonize the failed model of suburbia where most people lived. It knew its point before it started and declared, car-dependence as the problem without acknowledging both are not causes but rather symptoms of deeper policies, which effectively subsidize parking, free roads, and more and never-ending road construction. One of these codification issues is that of traffic engineering and the supposedly scientific but decidedly inaccurate methodology of traffic projecting (and potentially even disingenuous if not corrupt). These formulae are intended to determine how much traffic will potential development generate and how much road capacity must be expanded by to accommodate. By making every trip a car trip, a truly suburban model, it becomes a self-fulfilling prophecy. All roads must be widened. And as we know, wide roads and fast moving traffic provide a negative experience between building interface and conduit (if I’m to use the terms of a Houston blogger), much like putting two North-poled magnets next to each other. The other issue is that this is a completely backwards way of city building. Historically, before more speculative supply-side expansion, infrastructure followed growth rather than expanded infrastructure leading growth. When it happens backwards like this, not being demand driven, it ends up cannibalizing from the core city leading to an unsustainable condition of overextended infrastructure. But, road building meant jobs and profligate Keynesian spending and greenfields once provided a promise that city’s plagued by poverty and pollution once couldn’t live up to. They can now, as suburbs have proven to be desolate deserts of mental and emotional stimulation. The process works by often arbitrarily saying that x amount of square footage of y land use will go here and we will have to build a road to it, to make it achieve that promised level of tax base. 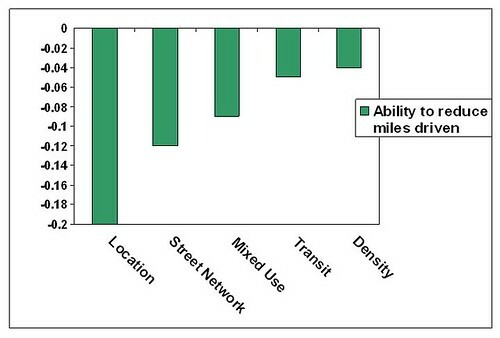 As mentioned, the problems arise in that all uses, no matter location, modal choice, street network, density, etc. is properly factored into the equation. My loft downtown generates the same amount of trips as does a house on a cul-de-sac in Wylie. Fortunately, other people are acutely aware of the bluntness of our urban instruments and some cities are actively working to establish proven hierarchies for better traffic modeling, such as San Diego which recently adopted a classification dichotomy of essentially walkable urban mixed-use and conventional suburban development. The question then becomes, is this enough? I would say no, but optimistically suggest this is just a baby step towards a smarter system. One reason, is that I’m already aware of a third level in the hierarchy from local developments. Rather than walkable urban and suburban, there should at least also be walkable suburban. I say this because residential mixed-use projects in very urban areas of Dallas have shown a 40% decrease in car trips from the conventional standard and residential mixed-use in walkable suburban projects have shown a 20% decrease (of course, there is a quality of planning and design quotient to be applied here — not all “mixed-use” projects are the same). Furthermore, these are all about car trips and the majority of car trips are less than 5 miles. As we build distance appropriate infrastructure amenable to sustainable transportation, the mode share of other forms increases, which in turn increases the capacity of infrastructure as a road can handle far more people on dispersed forms of transportation (foot, bike, bus, and car, etc.) than car only. This means both further reduction in necessary pavement down the road by reducing trips and increasing the share of other forms of transit thus increasing the capacity of existing streets. For broke cities, states, and DOTs, over-abundance of right-of-way will be the number one long-term strategy for getting out from under the budget crunch, and building more resilient, efficient lovable cities. But, we have to have the tools to get there.